استفاده از جاذب‌های سیلیکاته میان- حفره به‌دلیل کارایی بالا برای حذف فلزات سنگین از آب و فاضلاب مورد توجه واقع شده است. MCM-48 یک جاذب سیلیکاته میان - حفره است که با اصلاح سطح آن به‌وسیله گروه‌های عاملی، می‌توان ظرفیت جذب فلزات سنگین را بهبود بخشید. 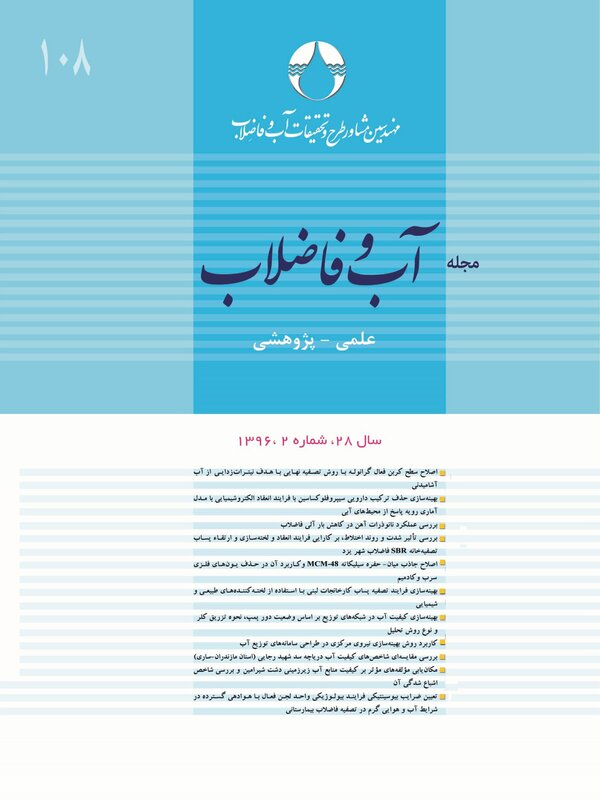 در این مطالعه با عامل‌دار کردن میان- ‌حفره MCM-48 با گروه عاملی آمین و سنتز NH2-NH-NH-MCM-48، حذف یون‌های فلزی سرب و کادمیم از محلول‌های آبی بررسی شد. مشخصات جاذب سنتز شده با پراش پرتو ایکس و میکروسکوپ الکترونی پیمایشی آنالیز شد. بررسی جذب در مقدار جاذب از 125/0 تا 10 گرم در لیتر، pH اولیه محلول از 2 تا 6 و غلظت اولیه محلول 5 تا 60 میلی‌گرم در لیتر انجام گرفت. داده‌های آزمایش با استفاده از همدمای لانگمیر و فروندلیچ و با آنالیز رگرسیون غیر خطی، تجزیه و تحلیل شد. طبق پارامترهای همدمای لانگمیر، حداکثر ظرفیت جذب NH2-NH-NH-MCM-48 برای هر دو یون فلزی کادمیم و سرب نسبت به MCM-48 بالاتر بود و برای یون‌های فلزی کادمیم و سرب به‌ترتیب 7/82 و 24/119 میلی‌گرم بر گرم محاسبه شد. نتایج نشان داد که با اصلاح MCM-48 با گروه عاملی آمین و تهیه NH2-NH-NH-MCM-48 می‌توان ظرفیت جذب آن را به‌طور قابل توجهی بهبود بخشید و به‌عنوان یک جاذب مؤثر در حذف یون‌های فلزی سرب و کادمیم از محلول‌های آبی مورد استفاده قرار داد. Mesoporous silica adsorbents have been gaining increasing importance in the removal of heavy metal ions from water and wastewater. MCM-48 is a mesoporous silica adsorbent whose adsorption capacity of heavy metal ions can be drastically improved when it is modified by functional groups. The present study investigated the removal of lead and cadmium metal ions from aqueous solutions using the modified NH2-NH-NH-MCM-48. The nanoparticles were characterized by Scanning Electron Microscopy (SEM) and X-ray Diffraction (XRD). The adsorption process was optimized by varying adsorbent doses from 0.125 to 10 g/l, the initial solution pH from 2 to 6, and the initial metal ion concentration from 5 to 60 mg/l. The equilibrium data were analyzed using the Langmuir and Freundlich isotherms using a nonlinear regression analysis. According to the parameters of the Langmuir isotherm, NH2-NH-NH-MCM-48 recorded a higher maximum adsorption capacity for both Cd(II) and Pb(II) than MCM-48. The maximum adsorption capacities of NH2-NH-NH-MCM-48 for Cd(II) and Pb(II) were calculated to be 82.7 and 119.24 mg/g, respectively. The results suggest that MCM-48 modified with the amine functional group to synthesize NH2-NH-NH-MCM-48 significantly improves its adsorption capacity so that it can be recommended as an effective adsorbent for the efficient removal of Cd(II) and Pb(II) metal ions from aqueous solutions. Adams, T.M. 1985, "The effect of pH on the uptake of zinc, copper and nickel from chloride solutions by an uncontaminated sewage sludge", Environmental Pollution Series B,Chemical and Physical, 9, 151-161. Algarra, M., Jiménez, M.V., Rodríguez-Castellón, E., Jiménez-López, A. & Jiménez-Jiménez, J., 2005, "Heavy metals removal from electroplating wastewater by aminopropyl-Si MCM-41", Chemosphere, 59, 779-786. Anbia, M. & Khoshbooei, S., 2015, "Functionalized magnetic MCM-48 nanoporous silica by cyanuric chloride for removal of chlorophenol and bromophenol from aqueous media", Journal of Nanostructure in Chemistry, 5,139-146. Anbia, M. & Moradi, S.E., 2009, "Removal of naphthalene from petrochemical wastewater streams using carbon nanoporous adsorbent", Journal of Applied Surface Science, 255, 5041-5047. Benhamou, A., Baudu, M., Derriche, Z. & Basly, J.P., 2009, "Aqueous heavy metals removal on amine-functionalized Si-MCM-41 and Si-MCM-48", Hazardous Materials, 171, 1001-1008. Benhamou, A., Baudu, M., Derriche, Z. & Basly, J.P., 2009, "Aqueous heavy metals removal on amine-functionalized Si-MCM-41 and Si-MCM-48", Journal of Hazardous Materials, 171, 1001-1008. Bibby, A. & Mercier, L. 2002, "Mercury(II) ion adsorption behavior in thiol-functionalized mesoporous silica microspheres", Journal Chemistry of Material, 14, 1591-1597. Chen, A-H., Liu, S-C., Chen, C-Y. & Chen, C-Y., 2008, "Comparative adsorption of Cu(II), Zn(II), and Pb(II) ions in aqueous solution on the crosslinked chitosan with epichlorohydrin", Journal of Hazardlus Materials, 154, 184-191. Chen, J., Fang, K., Wu, L., Qian, Z. & Chen, J., 2011, "Removal of Cd(II) from aqueous by adsorption onto mesoporous Ti-MCM-48", Procedia Environmental Sciences, 10, 2491-2497. Choi, M. & Jang, J., 2008, "Heavy metal ion adsorption onto polypyrrole-impregnated porous carbon", Journal Colloid Interface Science, 325, 287-289. Dong, D., Liu, L., Hua, X. & Lu, Y., 2007, "Comparison of lead, cadmium, copper and cobalt adsorption onto metal oxides and organic materials in natural surface coatings", Journal of Microchemisrty, 85, 270-275. Dönmez, G. & Aksu, Z., 2002, "Removal of chromium(VI) from saline wastewaters by Dunaliella species", Process Biochemistry, 38, 751-762. Ebrahimzadeh, H., Tavassoli, N., Amini, M., Fazaeli, Y. & Abedi, H., 2010, "Determination of very low levels of gold and palladium in wastewater and soil samples by atomic absorption after preconcentration on modified MCM-48 and MCM-41 silica", Journal of Talanta, 81, 1183-1188. Faghihian, H. & Naghavi, M., 2014, "Synthesis of amine-functionalized MCM-41 and MCM-48 for removal of heavy metal ions from aqueous solutions", Separation Science and Technology, 49, 214-220. Heidari, A., Younesi, H. & Mehraban, Z., 2009, "Removal of Ni(II), Cd(II), and Pb(II) from a ternary aqueous solution by amino functionalized mesoporous and nano mesoporous silica", Journal of Chemistry Engineering, 153,70-79. Lam, K.F., Yeung, K.L. & McKay, G., 2006, "A rational approach in the design of selective mesoporous adsorbents", Langmuir, 22, 9632-9641. Lam, K.F., Yeung, K.L. & McKay, G., 2007, "Efficient approach for Cd2+ and Ni2+ removal and recovery using mesoporous adsorbent with tunable selectivity", Journal of Environmental Sciences and Technology, 41, 3329-3334. Molinari, R., Poerio, T. & Argurio, P., 2008, "Selective separation of copper(II) and nickel(II) from aqueous media using the complexation-ultrafiltration process", Chemosphere, 70, 341-348. Mureseanu, M., Reiss, A., Stefanescu, L., David, E., Parvulescu, V., Renard, G. & Hulea, V., 2008, "Modified SBA-15 mesoporous silica for heavy metal ions remediation", Chemosphere, 73, 1499-1504. Rozada, F., Otero, M., García, A.I. & Morán, A., 2007, "Application in fixed-bed systems of adsorbents obtained from sewage sludge and discarded tyres", Journal of Dyes and Pigments, 72, 47-56. Sari, A. & Tuzen, M., 2009, "Kinetic and equilibrium studies of biosorption of Pb(II) and Cd(II) from aqueous solution by macrofungus (Amanita rubescens) biomass", Journal of Hazardous Materials, 164, 1004-1011. Sari, A., Mendil, D., Tuzen, M. & Soylak, M., 2008, "Biosorption of Cd(II) and Cr(III) from aqueous solution by moss (Hylocomium splendens) biomass: Equilibrium, kinetic and thermodynamic studies", Journal of Chemical Engineering, 144, 1-9. Tian, S., Jiang, P., Ning, P. & Su, Y. 2009, "Enhanced adsorption removal of phosphate from water by mixed lanthanum/aluminum pillared montmorillonite", Journal of Chemical Engineering, 151, 141-148. Journal of Biotechnology Advances, 24, 427-451. Wang, L., Shao, Y., Zhang, J. & Anpo, M. 2006, "Synthesis of MCM-48 mesoporous molecular sieve with thermal and hydrothermal stability with the aid of promoter anions", Journal of Microporous Mesoporous Materials, 95, 17-25. Yokoi, T., Yoshitake, H., & Tatsumi, T., 2004, "Synthesis of amino-functionalized MCM-41 via direct co-condensation and post-synthesis grafting methods using mono-, di- and tri-amino-organoalkoxysilanes", Journal of Material. Chemistry, 14, 951-957. Yunus Pamukoglu, M. & Kargi, F. 2006, "Removal of copper(II) ions from aqueous medium by biosorption onto powdered waste sludge", Journal of Process Biochemistry, 41, 1047-1054.